STANDISH — A man and a woman have been arrested in connection with an armed robbery early Monday morning at a home in Standish. RAYMOND — A couple who were shot to death March 15 in New Hampshire had previously been Raymond residents, according to friends of the family. James Eckert, 48, and Lizette Eckert, 50, were found inside a home in Alton, New Hampshire, The Associated Press reported. An 11-year-old boy has been arrested and charged with the shootings. The couple, both chiropractors, previously lived in Raymond and operated Innate Chiropractic in South Portland for more than a decade in the late 1990s and early 2000s, according to former employees who remained friends with the Eckerts. Lizette Eckert was pronounced dead at the scene. An autopsy showed she died from a single gunshot wound to the head. James Eckert was taken to a hospital in critical condition and later died. WINDHAM — The Community Center Ad Hoc Committee is sponsoring the third and final public forum to discuss a new community center from 6 to 7:30 p.m. Monday, March 25, at the Town Hall gym. Planning firm Harriman will introduce a final design concept for the project and gather feedback from the public. The group will also summarize the input it received from previous public forums and discuss construction costs. Light refreshments will be served and there will be door prizes. GORHAM — Naples-based Sebago Lake Anglers’ Association, Windham-Gorham Rod and Gun Club and Standish Fish and Game Club will jointly host Commissioner Judy Camuso of Inland Fisheries and Wildlife for a Sportsmen’s Forum Wednesday, March 27. Sportsmen and women will have the opportunity to express concerns and ask questions about rules and regulations. The event, at the Rod and Gun clubhouse, 8 Tow Path Road in Gorham, off Gray Road/Route 202, will begin at 6:30 p.m. with a spaghetti dinner. Spaghetti, salad, garlic bread, dessert and beverages will be served for a $5 donation. For more information, call Bob Chapin at 571-217-1700 or 655-1028. WINDHAM — Catholic Charities Maine will hold a workshop Saturday, May 18, designed to provide information and access to resources for anyone concerned about the challenges that come with growing older. The free workshop is scheduled for 9 a.m. to noon at Our Lady of Perpetual Help Church, 919 Roosevelt Trail. Call 781-8550 or email psm@ccmaine.org for more information. 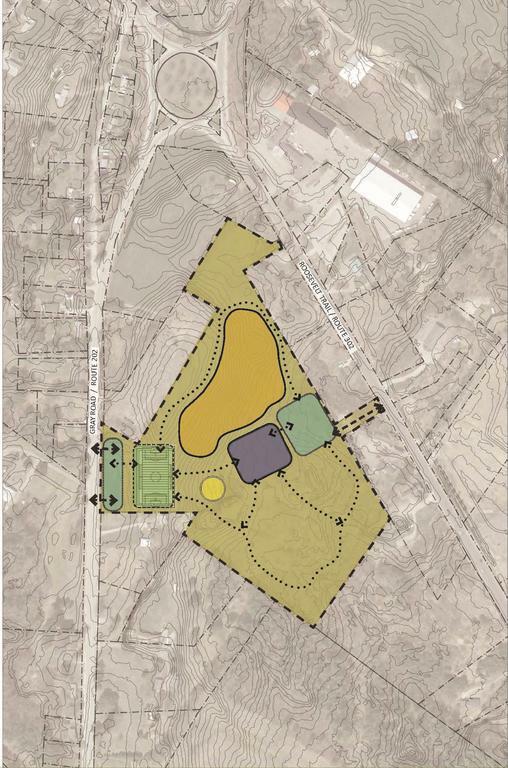 This concept, one of three designed for the Windham Community Center, was presented at a Dec. 3 public forum. It includes high-school level athletic fields and a playground.